We've been busy putting together the third and last of our podcasts. Our previous DDF project on Body Arts was the first time we really focussed on multimedia resources as a way of communicating new voices and insights into the collections. We talked to a variety of people, many in the form of audio podcasts. This time, for Small Blessings, we decided to go one better and create video podcasts (or 'vodcasts'). We decided to keep costs down and boost in-house skills by doing it ourselves. 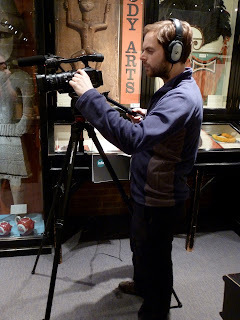 A handful of staff, including myself, had begun to learn the basics of film-making and editing by attending courses and watching online tutorials, so through trial and error we built our confidence with the equipment and technology. Who would feature in these podcasts? We wanted a variety of opinions and thought about the sorts of people who might have dealt with amulets. 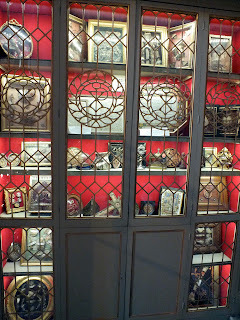 We approached Andrew Graham-Dixon, one of the world's leading art critics, in particular because he had recently done a TV series with the British Museum looking at medieval Christian art; Feclicity Powell, an Oxford-based artist who'd just curated an exhibition of Pitt Rivers' Lovett amulets at the Wellcome Collection; and finally, Fr Joseph Welch, a priest at the local Oxford Oratory Catholic Church of St Aloysius Gonzaga who we thought might be interested in the reliquaries in the de Mortillet collection in view of the substantial collection of relics cared for by the Oratory. All three experts expressed an interest in the project. 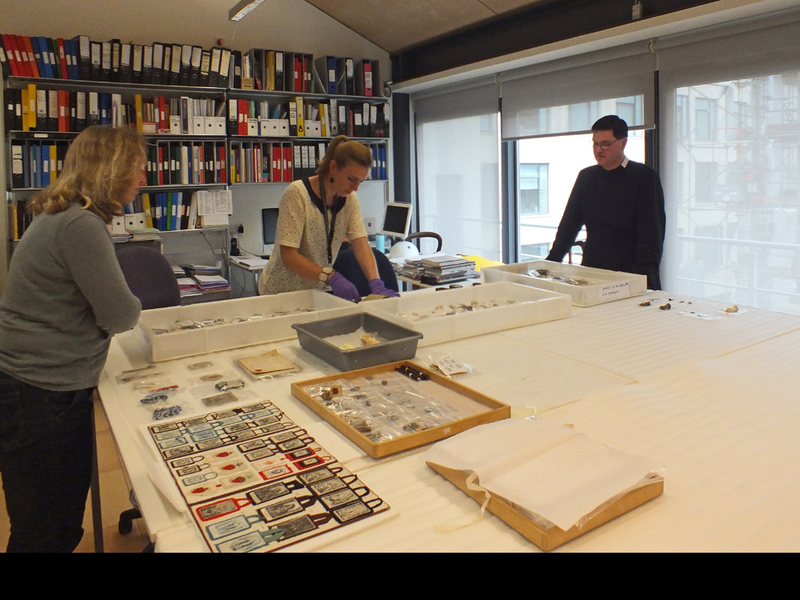 On each occasion we invited the person to the Museum to have a look at some of de Mortillet amulets; we were very grateful that Mr Graham-Dixon drove up from London to accommodate us amid other commitments and a heavy cold! We then had an open session, sharing what we knew - substantial research in some instances, very little in others - and eliciting responses and ideas that might make for interesting content in an interview. 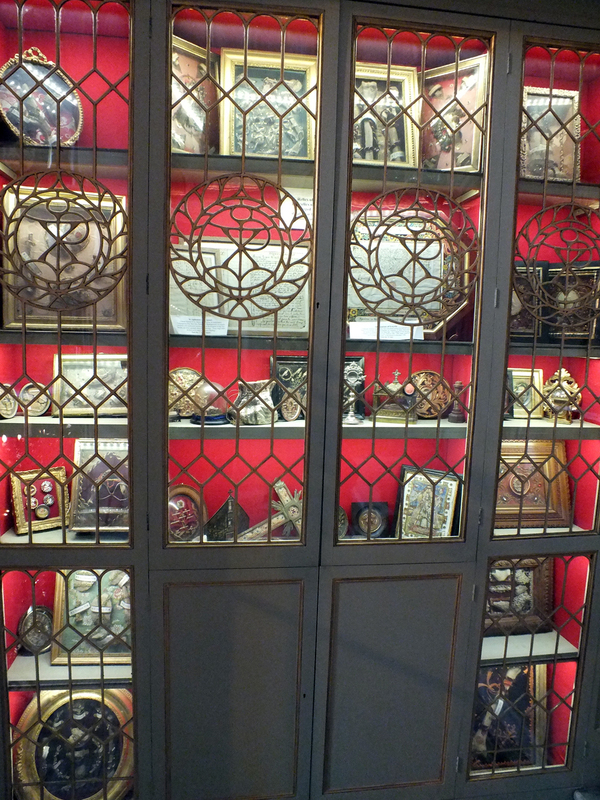 For example, Mr Graham-Dixon ruminated on the eclectic nature of de Mortillet's collecting habits and how many of the amulets captured popular art styles and religious beliefs. Felicity Powell talked about the individual lives and stories each object represented and even brought in her own poignant amulet - a battle-damaged button that had belonged to her father. Our most recent visit was from Fr Joseph Welch at the end of July which yielded interesting and reflective discussions about historical and current modes of devotion. We followed this up by filming the actual podcast in the wonderful surroundings of the Oratory church this week and capturing the weekly veneration of their relic of St Philip Neri. It's been wonderful to meet all three of our guests and hear the fascinating and thought-provoking things they've had to say about this collection. We appreciate them giving up their time to be involved with this project. We're now working hard to get the films finished so they can be added to the Small Blessings website which will be launched soon. We hope you'll enjoy them too!